Summary Intel Pentium G850 seven-bay BYOD NAS with USB 3.0, HDMI and 10 GbE ports, supporting multiple volumes and filesystems with many serving options. Until recently, the cost of 10GbE NICs and switches and their reliance on SFP and Direct Attached Twin Axial Cabling have made 10GbE a pricey option for the few NASes that supported 10GbE. But Intel's $350 X540-T1 NIC that connects to standard RJ45 / CAT6 cabling has brought 10GbE within the reach of small businesses and prosumers that just have to have the highest performance possible from their networked storage. At around $1300, Thecus' N7710-G is aimed directly at scratching that higher-throughput itch without driving buyers into the poorhouse. It sports a built-in 10GbE port nestled into its single PCI-e slot, plus two aggregatable 1 Gigabit Ethernet ports. It's also available sans the 10GbE port as the N7710. 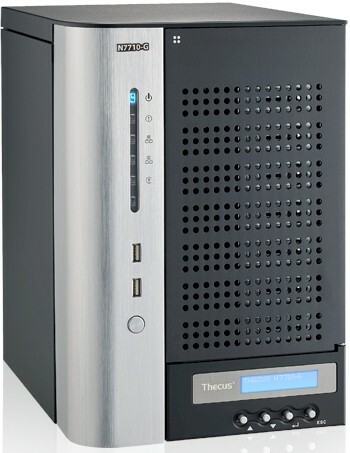 The N7710-G effectively replaces the TopTower N6850 [reviewed] that is currently the entry-level NAS in Thecus' "Large Business-Tower" line, even though the N7710-G is positioned as the top end of Thecus' "SMB-Tower" group. To save cost, the N7710-G swaps the TopTowers' touch-sensitive glass panel for the old-school LCD and button interface found on the other "SMB-Tower" models like the N7700PRO v2 and N7510 [reviewed]. The rear panel view below shows four more USB 2.0 ports for a total of six and there are two USB 3.0 ports, dual aggregatable Gigabit Ethernet ports and both HDMI and VGA ports for monitor attachment. The blank slot at the top of the photo below should show the single RJ45 10GbE port provided by Thecus' C10GT PCIe card. The NIC compatibility list shows other 10GbE NICs from Emulex and Intel that alternatively could be user-installed. I used four WD Re 3 TB drives provided by WD (WD3000FYYZ-0) for testing. They brought total power consumption with all drives spun up to 76 W. The drives all spun down after the 30 minute idle time so that I could measure 43 W in that mode. The N7710-G is relatively quiet, considering its power draw. I rated its noise level as medium, coming mostly from the system fan. With all seven drives loaded, I imagine it could move up to medium high.